From my experience working with Etsy sellers over the past year as a coach and few years as a mentor and friend, I’ve come to the conclusion that there are three main categories of Etsy sellers out there. I don't think that you're stuck in the category that you're presently in, if that's not really where you want to be. However I think you have to make a conscious decision to make changes to your hobby or business in order to move on to another category of seller. First off, we have the hobby sellers. These are people who make things for fun or have a hobby that people have told them that they should sell on Etsy. They aren't really trying to make a business, and they don't really care if they are making money or how much money they're making. Often times, they are very disorganized with how they are approaching their business, because in their minds it's not really even a business at all. They are the ones who want to make what they want to make, and they don't really care so much about appealing to their customers or even really figuring out who their customers are. Ultimately they just have a hobby that they've maxed out the amount of they can have around their own house. Being a hobby seller is where a lot of people start out, because they have something that they really like to make but they can only make so many for themselves or the people that they know in their real life. So they start selling on Etsy because they want to keep making, but they don't really have anything to do with the things that they are making. They have a real passion for the creative, and love to see their vision and their Creative Energy come to life through the products that they're creating. Hobby sellers are often the ones that have dramatically underpriced their items because they're not calculating their time as a part of the pricing, and also because they're really not approaching this as a business. They don't care if they make a profit, they just want to break even. The downside of buying from a hobby seller, is that they are also not approaching the manufacturing and shipping of their product As a business, so the turnaround times are often very long, and or they are unreliable in their shipping and their customer service, and they don’t feel a huge obligation to improve on these things. Next steps for a hobby seller? Keep doing what you’re doing. Having a hobby is a great stress reliever and way to exercise your creative muscles! Next up we have the hobby seller who wants it to be more. These are usually the people who have been selling on Etsy for a little while, maybe have a couple hundred sales, and they want to make this a business that can bring in a more consistent income or a higher income than what it currently is bringing in. They can also be people who are fairly new to Etsy but they definitely know they want this to be more profitable than just a hobby. “Hobby sellers who want more” often times aren’t really sure how to increase their sales, and they don’t have a super great grasp of how people move from being a hobby seller to a full time seller. They have a tendency to feel overwhelmed at the Etsy platform, and feel frustrated or confused as to how to increase their sales. They also feel overwhelmed at the business side of things - how do we establish a customer base that returns for repeat purchases, how do we stand out as a business and not “just another Etsy shop,” and what the heck do we do with taxes?!? Hobby sellers who want more place WANT to make a profit on their items, but they feel like Etsy is a race to the bottom on pricing (see the reason for this with the above about hobby sellers) and they feel like they may never be able to have prices high enough to make a profit that is reasonable. Making the move from hobby seller to hobby seller who wants more has to do with a mindset shift even if nothing else in their shop has changed - instead of being ok with a hobby that doesn’t really bring in income or brings in very inconsistent income, they want something that can financially contribute to their family. But many have never run a business before, and so are very overwhelmed at how to make that physical shift once the mental shift has happened. Side note: These are my favorite sellers to work with, because they have the drive to increase their sales and make this a business, but they just need help with the logistics. My paid program, Etsy Setup Success is perfect for this category of seller. The last section of sellers that I see on Etsy are the full time sellers. These are usually people who have been at it a while, and they’ve figured out a way to make an income from Etsy. They understand what their product and shop offers that makes them stand out on Etsy, and they have at least a basic understanding of building a community and maximizing their SEO for best results. These sellers see the opportunity that Etsy has for them, because they are living it every day through the income that they are bringing in and the flexibility that they have by being their own boss and working from home. Think about it - 20 or so years ago if you wanted to start a business, you’d have to have a product that you developed and mass produced, a storefront (with or without investors), machinery such as a cash register, and probably employees because you can’t be there ALL the time. You’d be working retail hours, so your weekends and evenings would be taken up, and the holidays would be crazy hectic. I LOVE talking to other full time sellers, because we can all acknowledge with gratitude, and frankly wonderment at what an amazing time it is in e-commerce, the internet, and just the world of retail that the starting costs are so low and allow for such an amazing level of income. Often times, full time sellers are still working at increasing their sales and their shop’s success. They strive for more - more community involvement, more repeat customers, and higher profit margins. They understand that a business needs all of these things, and that there are ways to improve on your business all the time. Next steps for full time sellers? Where do you fall? Where do you WANT to fall? Are you happy with your position in the Etsy world, or are you hoping to move to the next level of sales? 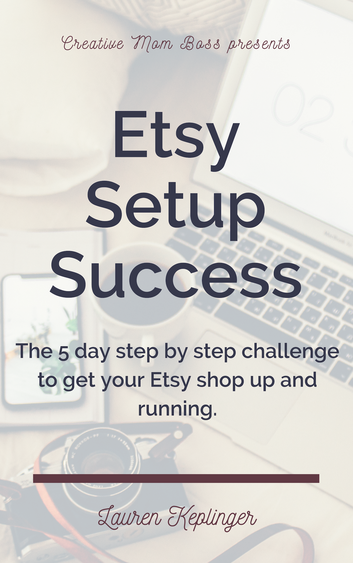 If you’re JUST getting started on Etsy, I’d highly recommend you check out my free 5 day email course, Etsy Setup Success, which walks you through a step by step approach to getting your shop up and open. Once your shop is open, I’d love to have you join the Etsy Setup Success paid program, which picks up where the free program leaves off and takes you through the necessary steps to go from hobby seller who wants more to full time seller.